D.K. is a DJ and composer who sits at the centre of the Parisian electronic music scene. Releasing music on labels such as Antinote, Melody As Truth, Music From Memory’s Second Circle and L.I.E.S (as 45 ACP), D.K. is a versatile musician who keeps exploring uncharted dimensions of modern electronic music. His compositions gracefully walk organic sounds through electronic landscapes to create a timeless sound that can range from exotic and playful to introspective and grounding. 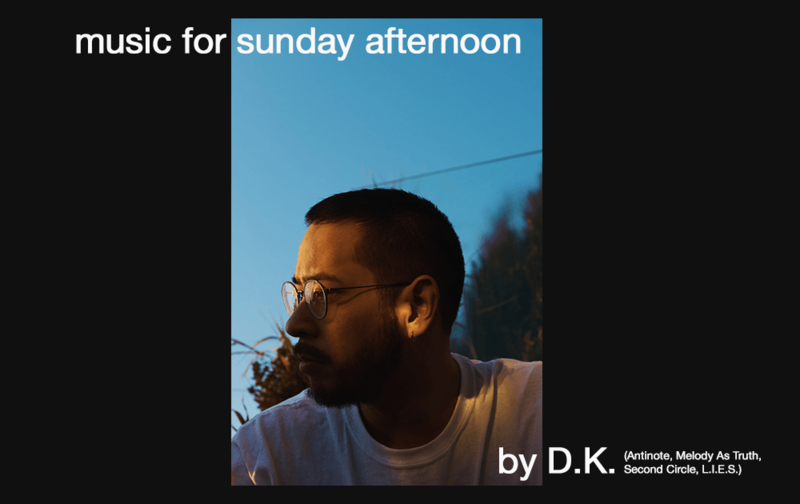 Here he has put together a selection of songs that are simultaneously thought provoking and relaxing - perfect for a Sunday afternoon. This track by Paul Schütze aka Uzect Plaush is a look into ambient electronic music from the early 90’s, in the same vein as other artists like In-Excistance or Biosphere who released on R&S’s sub-label Apollo too, in the same year. It’s a 7 min hypnotic loop of floating melodies and sci-fi bubbling ambient atmosphere. Recorded in July 1980 in Milan and released on vinyl 10 years later on Casal Gajardo Records, it’s a mysterious sound experience with a perfect balance between ancient, ethnic and analog electronic music. Check also the reissue on Black Sweat Records, « Isole Del Suono ». Principe strikes again with this sick first LP from Niagara. With just a few elements on repeat like a primitive beat, some wood shakers and bird sound effects mixed together with slight changes, it seems like the flute just has to choose a path to flow into this tropical environment. First band of Caroline Williams, Valerie Skeete and Vyris Edghill before they formed Akabu on 1983. Classic reggae tune right here. Probably one of the best releases I’ve been listening to this year. Inspired by Bollywood, Thai Films, and Indonesians music, this unique sound, put together with dub music techniques and South American rhythms, brings the tribal electronic music genre to another level. A New Heaven is an excursion into ambient and minimalist music, produced with lyrical drones, a distant piano and field recordings. Despite an extremely simple melody, Chalk succeeds in creating a strange nocturnal atmosphere and brings the listener into romantic landscapes.